Are you a person or company that does a lot of postings? Are you aware that there are best times and worst times to post content? If not, read on. Why, because your pr marketing strategy can be a success or failure if you don’t know when your followers are interested in their social media. So make sure your followers/readers are seeing your posts, otherwise you are wasting your time. I came across this great article and graphics from Richard Brownell, so thanks to Richard for making this simple to understand. Ok, lets start with the more staple social media. That would be Facebook, Twitter and LinkedIn. These are the more popular and better know social media for businesses. 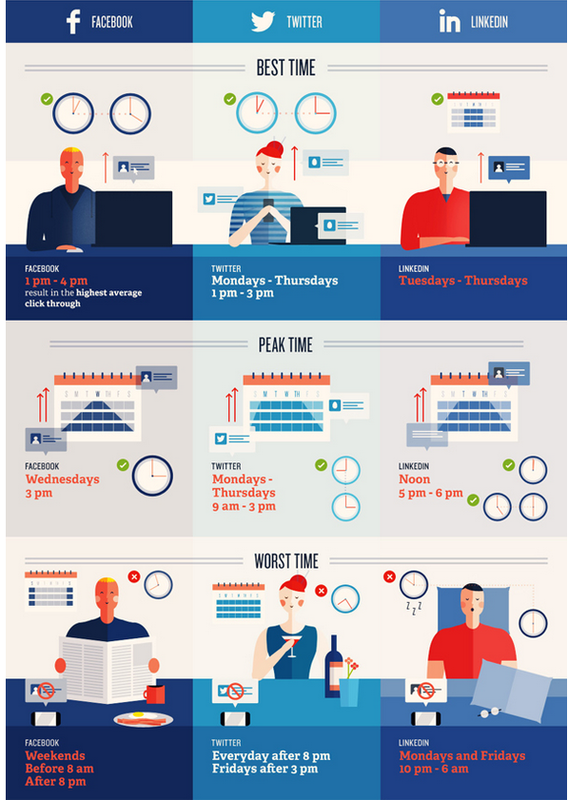 Below is a chart that illustrates what days of the week and times of the day that you should be posting, and when not to. 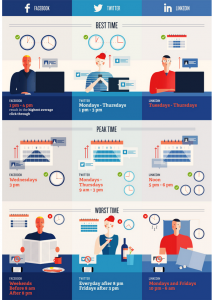 On Facebook, which is one of the most frequented social media sites, you should be active between 1pm- 4pm and the best day/time of the week is Wednesdays at 3 pm. Avoid weekends before 8 am and after 8 pm. I would stay away for weekends if you are a business, unless you have a retail store that is open on weekends. Twitter has a great readership Mondays-Thursdays from 1 pm – 3 pm. Almost the same time as Facebook followers. The peak time is Monday-Thursday from 9 am til 3 pm. Twitter readers move on to other things after 8 pm everyday and on Friday, so avoid any tweets after 3 pm. Probably they’re off to a party or fun weekend stuff. Now let’s look at LinkedIn. Seems Tuesdays-Thursdays are popular and the best times for the day are noon and again at 5 pm-6 pm. Most business people are not active Monday and Friday from 10pm-6am. Hey you gotta sleep sometime! Other social media like Pinterest, Tumblr and Google+ have a different schedule that people use. For example Pinterest has heavy viewing on Saturday mornings (well, that does make sense) and the worst time is during work hours. Now Google+ is different with their community of followers. Everyday between 9 am-10 am (short window isn’t it) is the best time and Wednesdays at 9 am is peak times. But then again, similar to Twitter, Google+ is for short messages. You want to know quickly what’s happening and move on. So there you have it. A quick insight on when to post and not post on your social media accounts. If you are developing a pr marketing strategy for the next season, keep these times and days handy so your social media campaign will have a greater impact. If you want more insights, give George Carson a call at 949-477-9400. He’s probably writing a post right now, but I’m sure he’ll take your call.